Intel Desktop Control Center is a PC-based desktop application which provides access to configuration options for your processor. 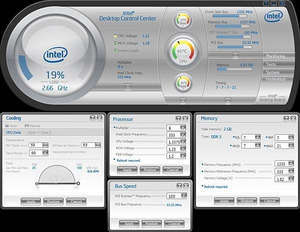 The main interface of Intel Desktop Control Center provides details about the temperatures of your system including core CPU temps, FSB, Memory Bus, PCI Express Bus and PCI Bus. It also displays CPU and MCH voltage figures. From elsewhere in the application, you may also access various cooling values which provides both manual and automatic control. Version 5.?5.?1. ?84 is a freeware program which does not have restrictions and it's free so it doesn't cost anything. For security reasons, you should also check out the Intel Control Center download at LO4D.com which includes virus and malware tests. Additional screenshots of this application download may be available, too. Intel Control Center download been highly rated by our users.